Well – I finally used the cell phone for an emergency ~ a DOG emergency ! 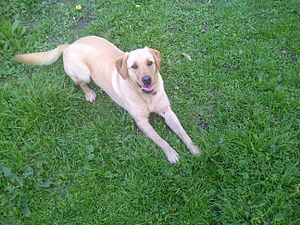 I put Patch out this morning and she started barking immediately ~ right outside the back gate was a big yellow Labrador Retriever. I went right out after Patch but not to worry, the visitor was just being a Lab ~ friendly, sniffing, finally sticking her nose through the gate and licking my hand – sooooooooo cute. While I was fastening Cleo to the outside of the fence, between the gate and the solid part, the phone rang. It was Cleo’s mom, Kelly, and she was in her car out looking for her wayward, but TAGGED pet: I gave directions while she drove and she pulled in ~ within minutes ! Cleo almost pulled down the fence when she spotted “her” car and I had trouble unlocking her through the fence. Kelly got out, left her door open, unleashed Cleo and she flew in. 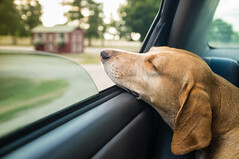 A yellow Lab is at home in a car window. We talked – Kelly has contractors in her house, just a few blocks from me, and somehow Cleo got loose. Yes – I feel the same way. It really started my day off right ! Yup- I was glad it ended well too.